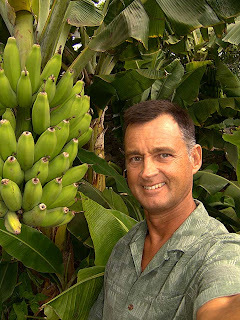 We leave on a one month vacation tomorrow at the worst time with five huge bunches of bananas about to come ripe, both mango trees loaded with fruit, way too much starfruit, and even the lilikoi vines are ready for picking. As many of you know I am cutlery challenged. Getting food to my mouth has always been an adventure with some of each meal invariably ending up on my shirt or my pants. The bits of food in my shirt pocket I can understand, but when I change for bed at the end of the day there is often a little tidbit lodged in my belly button. How does that happen? Day after day? Perhaps this is what is meant by "adventures in dining." 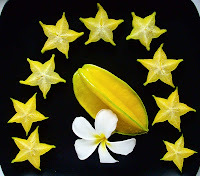 Starfruit are suddenly dropping from our starfruit tree in prodigious numbers. 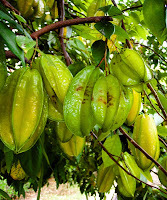 As with most fruit, the fruit which fully ripens on the tree is wonderful (as compared to what you get at the store which has been picked green). It has some of the texture of an apple and a mild flavor, but like most exotic fruit definitely has its own flavor. If you are in the neighborhood, help yourself to some; that is, if the birds and the wasps have left any. Snow and Ice on Maui? The pools left by the last high surf episode are drying out and leaving interesting salt deposits. 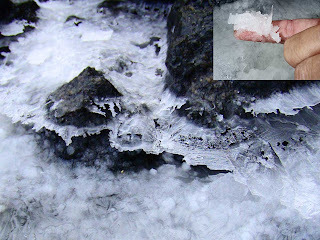 I was impressed by the crystals which formed as large, very thin sheets. Surfers were making the trek across the lava fields in search of the new south swell which is expected today. It hadn't arrived at La Perouse yet this morning, nor had the dolphins come in. With the howling wind and driving rain it was downright chilly, while a few miles away in Wailea it was hot and sunny. I started my morning with a meditative scanning of the waters at La Perouse looking for spinner dolphins. They decided to not visit for the second day in a row. So I went to Little Beach for a nice long swim. The water was choppy and the surf was up, but once away from the beach the visibility was great. In addition to all the usual fish I saw a group of small blue fin trevally and two large awa. There is still a large school of akule at the black sand beach but I only saw one barraccuda and no sharks today. The elevator was rocking and rolling with the rising surf. 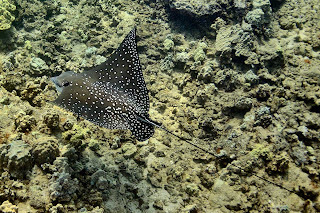 On my way back in I saw two spotted eagle rays. I wanted to get more photos but they were hanging in a strong current and I was too tired to keep up. 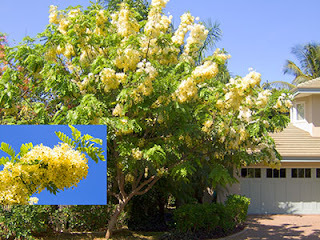 No dolphins at La Perouse this morning, but when I got home I noticed that the shower trees around our house are going off! They will continue to bloom like this for most of the summer, and of course shower the ground with flower petals. 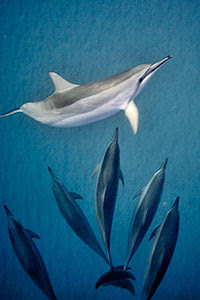 Spinner dolphins have been visiting La Perouse bay recently. They pretty much hadn't been seen for the duration of Humpback whale season, but in the past week have been in five times. I've been lucky enough to swim with them. Although they repeatedly swim by, they have not been interactive like they sometimes are. They have also been kind enough to pose for my still camera and my video camera. Yesterday's photos can be found by clicking HERE.